Before getting really into it let’s start with the disclaimer: There are many good community association managers (CAM), doing an excellent job! That much said, let’s get started: There are too many incompetent CAMs with a private agenda and open pockets who think they are in charge of the community they are only supposed to "Manage." Board members don’t seem to understand that they will in the end be held responsible for the actions of the CAM who they allow to make decisions with serious financial impact on the community. And since boards seem to sign contracts without reading or understanding them, the board members find out too late that they signed a contract stating that they have to pay the legal fees if a complaint against the manager is being filed with the DBPR. Only too often you see the association attorney filing the response to the complaint: In my opinion a clear CONFLICT OF INTEREST. The reason: Most of these responses contain the so-called Nuremberg defense: Adolf told me to do it! In this case it reads: I acted on orders of the board! Meaning: They are blaming the board members for violations of rules and statutes. That should be a clear warning to all board members that they just shouldn’t allow the CAM to run the show and make the decisions – if they don’t want to be blamed later for any serious problems. And then there are the many CAMs who think that their income needs an extra boost: They ask the vendors – behind closed doors – to give them a percentage of their bill -- either for getting them the contract or for "supervising" it. Some management contracts even contain clauses that require the association to pay the manager a certain percentage of the final bill (often for construction jobs) for supervising the job. That’s in my opinion a joke: Too many mangers barely know the basics to do the job they are hired to do, much less having knowledge about construction. How do you supervise something you know more or less nothing about? And then there are the management companies who own other service companies and don’t disclose to boards that the service company they are pushing are actually part of their corporation network? That’s the worst kind – and they are doing a lot more financial damage to associations than incompetent board members. Let’s say one thing here at the end of this year: Community associations are very tricky to run – especially considering the fact that managing such a community takes lots of skills – skills many of the folks in charge of these communities don’t have. 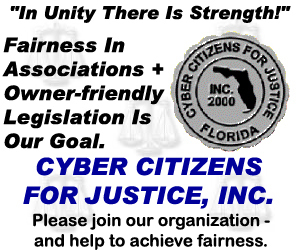 KNOWLEDGE IS POWER – that sure is a fact in Florida’s Community Associations!